Let’s face it: when adapting massively popular young adult literature onto film, quality is one of the last things on the studio’s mind. The main priorities are typically hot young leads, a pop soundtrack that melancholy 8th graders can listen to on repeat, and an excuse to publish a new edition of the source material. And John Green’s The Fault In Our Stars, unlike the Twilights and Mortal Instruments of this world, has no sequels. It’s a one and done effort, where the studio could take their money and run. So it pleases me to say that The Fault in Our Stars is more than a quick cash-in and more than a two-hour diversion; it’s a damn good film that’s sure to remain a favorite amongst millennials for years to come. That’s not to say this is a teens and tweens only affair, though Green’s loyal following of “Nerdfighters” will indeed eat it up. But there’s enough wit, pathos, and Laura Dern to move viewers of any age. Just as The Fault In Our Stars, as a film, is more than just a tossed-off YA adaptation, its story is more than just another tearjerker romance. Shailene Woodley plays Hazel Grace Lancaster, a cancer-stricken, oxygen tank-toting teen who meets and falls in love with the handsome, cancer survivor Augustus Waters, played by Ansel Engort. The two bond with a wit and dark sense of humor rarely seen in the sub-genre of “sick kids in love,” adding a humanity that may catch lovers of soap-operatic tearjerkers off guard. Not that this isn’t a tearjerker. It most certainly is, in almost every way. But the ever-present humor balances the film out, to the point where both the emotions and the laughs are able to take the viewer by surprise. In fact, The Fault In Our Stars might be the closest mainstream American cinema has gotten to a perfect laugh per cry ratio since Up. The film does fall into a few small traps of its many subgenres, however. The music is less than subtle, and yes, is partly here just to sell the previously mentioned soundtrack to 8th graders. But both score and song present in the film often undercut the impact of scenes, or at least remove any ambiguity. The source novel, while aimed at teens, never spoke down to its audience, and was able to take a step back, letting the reader have thoughts of their own. Are Hazel and Augustus a bit pretentious? In both the book and film, I’d say so, though in a way not unfamiliar to anyone that was once a teenager. 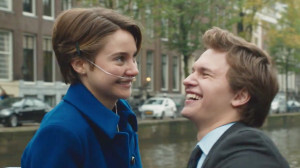 In the film, the score, in addition to the direction, often feel devoid of any hindsight or nuance, demanding the viewer feel as amazed by Augustus as Hazel is. This in no way is me criticizing the main romance. It’s outstanding, in fact, with Woodley and Engort’s chemistry effortlessly coming off the screen. Their performances are actually the most understated and subtle element of the film, never taking their many speeches or emotional breakdowns to “Oscar Scene” levels. Woodley’s proven herself time and again to be one of the best young actresses around, thankfully showing no signs of disappearing anytime soon. This was actually my introduction to Mr. Engort, who, in a role that a lesser actor could have botched completely, has immediately shown himself as a force to be reckoned with. 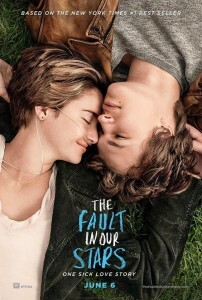 The Fault In Our Stars is more than a young adult adaptation, more than another sick-teen romance, and more than a simple night at the movies. It’s an emotional experience that’s far, far more than okay.